My life’s color hues changes constantly creating a spectrum of feelings, moods and emotions. I can go on and on enumerating what they are but in the end, there are only two colors I wish to keep and celebrate always, red for love and yellow for happiness. Yes, I got my share of blues, purples and greys but dwelling on them just wears me down. I choose to embrace color hues that inspires me to face another day, win another battle, conquer another fear and treasure in memory another unforgettable event. After our Brunch, we decided to extend our Birthday celebration by the beach. We thought of an outdoor place where our little boy had the happiest and fun of memories. Only one popped in our heads, Galveston Island State Park. 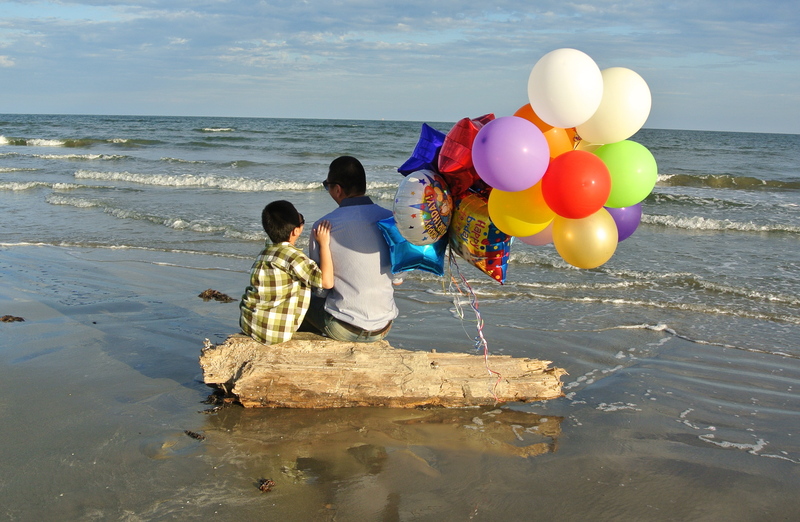 Early that morning, my wife whispered, “Hey, I want to surprise our son with balloons and a cake by the beach.” Excitedly, I replied, “That sounds like an amazing idea.” We made sure he gets his favorite colors especially yellow and gold. We also added a balloon with a picture of a dog and a cat, both of which he adores. A child’s Birthday party is never complete without the cake. That morning, we bought him a simple cake from Kroger’s with colors of sea blue, deep purple and mysterious black. Perfect hues to go with the sea creatures and fishing rod toys he chose from Dollar Tree. We held the cake carefully in the car, making sure all icing stay in place. We reached the Galveston State Park around 4 P.M. The weather was beautiful. Cool breeze, clear skies, waters so gentle and calm. After finding our ideal spot, it was time to run and play with the balloons. Just when I thought everything was moving smoothly, something slipped from the basket I was holding. I heard a “plop” sound. I looked down and saw the cake face down. I froze for a few seconds. I then glanced at my wife and said, “Oh, oh!” Sounding alarmed my wife screamed, “What happened? What did you do?” Looking sad, I answered, “Luv, sorry. The cake just slipped.” Before she got upset, I assured her, “But it’s okay. We’ll just cover the bald spots with the toy fishes.” It worked! We all sang the Happy Birthday song and asked our son to make his Birthday wishes. Smiling, he said, “I wish for a bike and a Lego toy.” I asked him, “Anything else?” He replied, “That’s it” and quickly blew the candle. The beautiful golden Sun was slowly setting down the west horizon of Galveston Island. It was time to let the balloons fly. 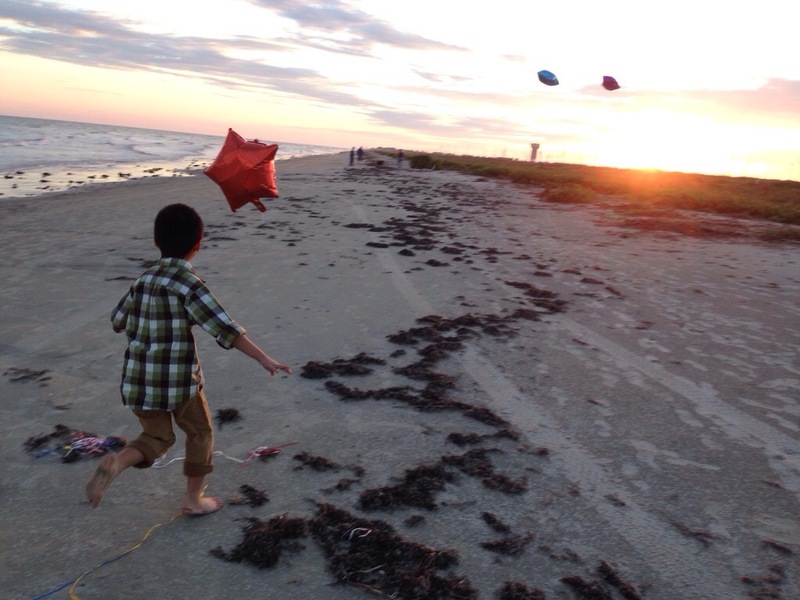 One by one, my son let go of the balloons starting off with the least of his favorite colors. His laughter filled the air as he chased the soaring balloons. As I watched the magic unfold before my eyes, I made the rest of the 6 wishes to complete the 8 wishes. 1. A world were he and all the children will be safe from harm, darkness and pain. A world where a child can live without fear. A world where peace and equality reigns. 2. That he will experience a lifetime of blessings. Blessings like love, joy, good health and freedom from heartaches. If heartaches happen, may he be surrounded by people who will help him heal and believe once more. 3. Most if not all of his dreams to come true. Dreams that will give him meaning and contentment. Dreams that will give him true happiness and calmness from within. 4. Family and friends who will nurture him with a loving heart, inspire him to become his best and to support him without conditions. 5. That he will always have a pure heart of faith no matter how many tests and trials will come his way. To have a heart that believes in hope and goodness in others. A heart that is simple, generous, kind and forgiving. A heart that puts God first on top of everything. 6. That he will have tons of fun, happy, memorable Birthdays, candles to blow, wishes to make and balloons to let go with the people he loves. As we picked up the remaining balloon strings, me and my wife agreed that this Birthday Party was one of the best ones we’d been to. Best because long after the Sun disappeared and the last candle blown off, the light, joy and warmth that families give to each other continues. Thank you for sharing your day with me and for sharing my wishes. Wishes are likely to come true when more hearts believe in them. A blessed, beautiful day to all. This entry was posted in Events, family, Family and friends, Inspiration, kids, Life, Love, nature, parenting, photography, Post A Week, Weekly Photo Challenge and tagged birthday gift, Children, Family, Life, parenting, Photography, summer, Texas, Travel, Weekly Photo Challenge. Bookmark the permalink. Thank you. It was my wife’s idea. Simple yet fun and memorable. It’s one of my favorites too. It is a happy, uplifting, energetic color. Thanks my friend. I will sure tell him that so many people thought about him on his B-day! Thank you for sharing this beautiful day with us. I wish you many many more. Thanks. Wishes I wish to share to all. WOW!! What a beautiful way to spend a birthday, love the balloons, sorry you dropped the cake, but you patched it up so beautifully. May all that you wished for your son come true. God bless you and your wonderful family. Thanks Linda. I hope and pray my wishes do come true for him and all the children out there especially the ones who lost and suffered so much at a very tender age. God bless you too and your family. Happy belated birthday to your son. Thank you for sharing your story. Your posts are always good for the soul, perfect with my coffee. Cheers! Coffee with a perfect story…always a great start for an amazing day. Thanks. Have a fun weekend. Another heartfelt story about your family and you–very fitting for the challenge. Enjoy your weekend. Thanks Sally. Family inspires us to make even the simplest of ocassions unforgettable. Thanks. May all our good wishes for our family come true. All the best to you and your family. May your life be filled with all this color and with only enough darkness for solitude, rest, and groundedness. That’s a beautiful , generous thought my friend. I hope that all the colors we hope to have will fill our lives and those around us. How lovely. What a wonderful birthday ~ thank you for sharing. Thanks. When we are with the people we care about, events turn into something amazing. And you can’t go wrong with Lego toys and a bike for an 8-year old boy. Sounds just perfect! It was a simple B-day but much more meaningful since it’s truly spent among people who are there for each other through the worst and best of times. When we are with family, everything seems happy and magical. Thanks. Very nice post! Happy Birthday to your son! Sounds like he had a splendid birthday!! We did. We didn’t want to go home but it was getting dark and we were the last one to leave the park. Family are one of our precious gift in this lifetime. Thanks. There were so many (beautiful) balloons that I really feared that that rock and your son would take off. 🙂 Belated Happy Birthday wishes to your son. I love your six remaining wishes for your son and all children. Excellent. Happy moments makes us feel like we are flying. The balloons did tip off the chair but did not fly. Thanks. Thanks Jo. On his B-day he reminded me that it’s the simple things that makes us happy. He didn’t ask much but gave so much more everyday to me and his mom. With our family around it’s a celebration everyday. How fun it is to celebrate birthday on the beach with dozens of balloonssss!!! You and your wife are wonderful parents!!!! 😀 Wish your son all the best!!!! It’s great to be a parent. Challenging yet so rewarding and fulfilling at the same time. I wish you all the best. You have created beautiful memories for your son on his birthday Island Traveler, ones that will plant seeds in his heart for a lifetime and that will burst forth in living colour like the Rainbow giving Hope for a beautiful tomorrow. Thanks Anne. It is my wish that my son and his generation will have all the beautiful colors in their hearts so they can create a better world for one another. They are infer the hope of tomorrow. God bless. Happy Belated Birthday to your Little Man. I hope the year to come is filled with days every bit as happy as his day at the beach. I hope so too. He finished his Lego Saturday and he looked so happy of its outcome. He built it in one morning and it was meant for age 9-14. I’m happy that he is happy. As parents, we need to support our kid’s dreams, big or small, possible to kind of impossible. No limits to a heart that believes, right? Thanks. What a lovely birthday! You must see the movie Wadjda about a 10 year old girl who wants a bike. Thanks. I will check that movie. Kids reminds us that happiness comes in simple packages. That we can have a humble party for three and still feel like it was the party of the century. Thanks. He makes us celebrate life and it’s blessings in a more meaningful way. He make us feel like we’re flying from happiness just like those balloons everyday. Your post came in perfect timing as I’m having my quiet time before sleeping. Great and inspiring post! Thanks. One of my favorite time is before sleeping and just after waking up. These are times of relaxation and clarity. Happy birthday for your sun! I think that the best present is that he has a loving, happy family every day. Yes, family is our best gift to have. They are our richest treasure. Thanks.